I mentioned to someone recently that with two teenagers headed off to college soon I just can't afford to plop down $17-20 for a CD anymore. Therefore, by necessity, this weblog is devoted mainly to older sounds. That means that I haven't heard African Scream Contest, Nigeria Special, or any of the great new reissues that everybody else in the African music blogosphere has been raving about. In my younger, more carefree days it was a different story. Back in the mid-1980s, when I first discovered Sterns in London, I made several big orders, totaling well over two thousand dollars. A favorable exchange rate didn't hurt either. At one point the Pound Sterling went for $1.03! Even taking postage and import duties into account the cost of a European-pressed LP was roughly equal to what I would pay for an American one. Not, of course, that anything I could get in a U.S. record store could equal anything Sterns had on offer! I generally didn't order specific recordings from the Sterns people (availability of particular titles was iffy anyway). Rather I would request x number of records, with the instructions that they were to select whatever was the latest and best from each particular country. It sure was a kick to go down to the post office, pay the import duty and then rush home to hear what they'd picked out for me! In this way I was exposed to an awful lot of excellent sounds that I might not have considered otherwise. I certainly wouldn't have heard any of the music that was coming out of Côte d'Ivoire (Ivory Coast) those days. As I noted in a previous post, that country has been host to numerous musical styles over the years. The latest is Coupé Decalé, which hit the scene around 2002. For many years the music of Côte d'Ivoire was overshadowed by the sounds coming out of its neighbors Ghana, Nigeria and especially Congo. Imported R&B from the US was also hugely popular, as it was everywhere in Africa. Local musicians like Amadee Pierre and Anoman Brough Felix made excellent music, but their popularity was confined mainly to their home country. By the mid '80s, when I got hip to their music, Ivoiriens were in the throes of Ziglibithy fever following the death of the founder and foremost practitioner of the style, Ernesto Djédjé (left). Djédjé was born in 1947 in Tahiraguhé-Ziglo of a Senegalese father and a mother of the Beté ethnic group. 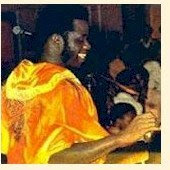 He conceived of Ziglibithy as the first truly "Ivoirien" popular music style, a response to the imported sounds washing over Côte d'Ivoire in the 1970s. The unique "jerky" rhythms of Ziglibithy are derived from Beté folklore and the LP Zibote (Badmos BLP 5020), the first recording to showcase the style, caused a sensation when it was released in 1977. Four more successful LPs followed, but on June 9th, 1983, while preparing for his next album, Djédjé died suddenly of an untreated ulcer. Is it necessary to repeat pain and fear? Is it necessary to relive the condemned cyclones and dirty dreams of June? He is dead, the king of Ziglibithy, and we cried all the tears of the heart and the body. That which is important was disarming for his pious and passionate disciples, and is less about crying for help or continuing to languish and always standing up tall, face turned toward the fire of the sun is the loud banner for the master whose shining image operates in them. It is about immortalizing the art of a king. This record attests to the hope that we bring Blissi Tebil, one of the sons of Ernesto Djedje, the only one and certainly among the most filled with promise: let's hold him in our hand in order to illuminate his way that will be long, long, long. . . in order to revive in us, eternally the voice of a dead god. Many thanks to my daughter Aku for translations that I used in this post. 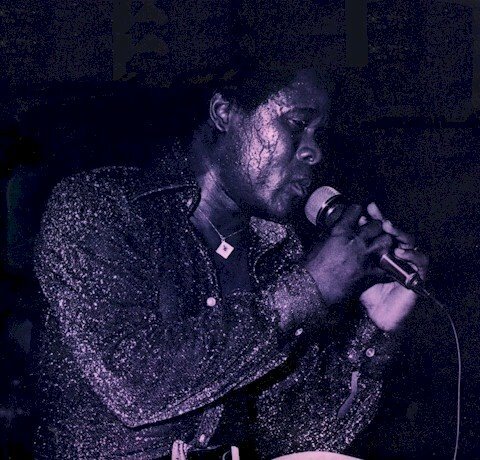 Further information was derived from the liner notes of Le Roi du Ziglibithy, Ronnie Graham's Sterns Guide to African Music and West Africa magazine. I've been inspired by my research for this post and will probably post more music from Côte d'Ivoire in the future.